OPEN AT THE BOTTOM. The wrap toe design and elastic top/bottom effectively covers your toes while still open at the bottom to allow for a stable foothold from the walking brace's tread. Fabric is 4-way stretch spandex, breathable and easy to clean. FABRIC IS NOT WATERPROOF. Easy to apply with zipper back! Elastic top/bottom for a gap-free, secure fit. 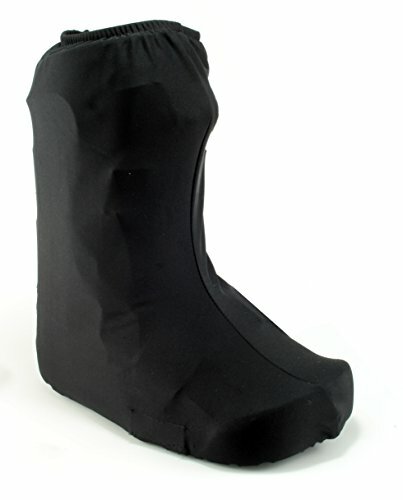 Universal fit for right or left foot and fits most orthopedic boot manufacturers. Item includes 1 cover. Medical boot not included. These covers are intended to go over the top, sides and front of the boot only, not the bottom. They are not designed to be worn over post-op or cast shoes. They should not be used to protect your brace against wetness while taking a shower or submerged in water. My Recovers provides a 100% Satisfaction Guarantee. If you are not completely satisfied with your purchase, you can return it for a refund or replacement. Universal fit for right or left foot and fits most orthopedic walking brace manufacturers. Only measurement you need is boot size! Medical walking boot not included. If you have any questions about this product by My Recovers, contact us by completing and submitting the form below. If you are looking for a specif part number, please include it with your message.